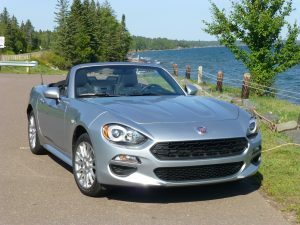 Fiat fitted its own drivetrain and bodywork to convert a Mazda Miata into the Fiat 124 Spider. 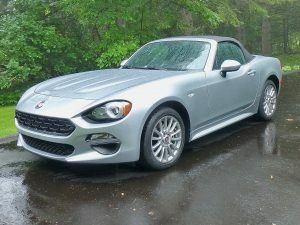 When you climb into a Fiat 124 Spider, right away you forfeit the right to complain about a laundry list of nitpicks that a lesser vehicle would justify arousing. a trailer, or about the fact that a little road or wind noise might creep into the cockpit. You can’t complain that it is a tight squeeze to climb behind the steering wheel, or that it requires a certain level of conditioning to hop out of its driver’s seat. Those allowances are easily made up for by the sheer joy of driving the 124 Spider, and it has always been thus. Back when the Fiat 124 was all Fiat, with its little Italian heritage and less-than neck-snapping acceleration, in exchange for a completely coordinated sports car, that could take on the best British MGs or Triumphs and deliver satisfaction. 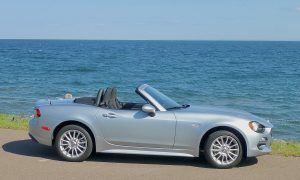 The 2018 Fiat 124 Spider is, of course, the Italian company’s spin on the perpetually satisfying Mazda Miata, now called the MX-5 at least as long as you are within earshot of any Mazda official. Otherwise, we all call it the Miata. Fiat arranged a deal with Mazda, when it wanted to recreate its old 124’s image, and Mazda provided the platform and bodywork of the Miata for Fiat to play with. First, Fiat took off the low horizontal grille that has been Mazda’s signature, and fitted it with a lower and wider oval opening that is, come to think of it, a quite-faithful rendition of the old 124, brought up to modern times. But mainly, Mazda kept its fantastic SkyActiv 20-liter 4-cylinder engine which delivers 155 horsepower and 148 foot-pounds of torque. Nobody ever complains that the Miata is underpowered, because that high-revving, naturally-aspirated 4 keeps revving and giving you easily adequate punch to make a tour around a cloverleaf feel exhilarating. 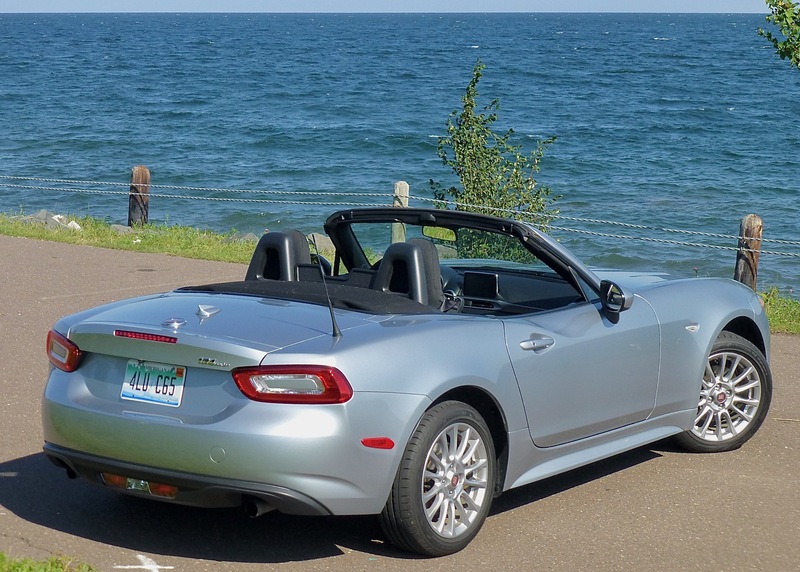 Framed by Lake Superior, the Fiat 124 Spider brings back to life its own iconic Fiat 124. But Fiat has built its own even smaller engines, and made the most of them with the MultiAir treatment to the valvetrain, and then turbocharging it. In that guise, the Fiat Abarth’s 1.4-liter 4-cylinder is more than 25 percent smaller than the Miata engine, yet puts out 184 horsepower and 184 foot-pounds of torque. That’s a lot of power from such a small engine, which best defines the wonder of turbocharging to force a greater volume of fuel-air mixture into the engine. With a 6-speed manual transmission standard, the front-engine, rear-drive 124 Spider feels every bit as perfectly balanced as the Miata, and if it looks slightly less sporty than the Miata, it also has a bit more of a classic appearance, befitting a company that also presented Ferraris to the world for so many years. 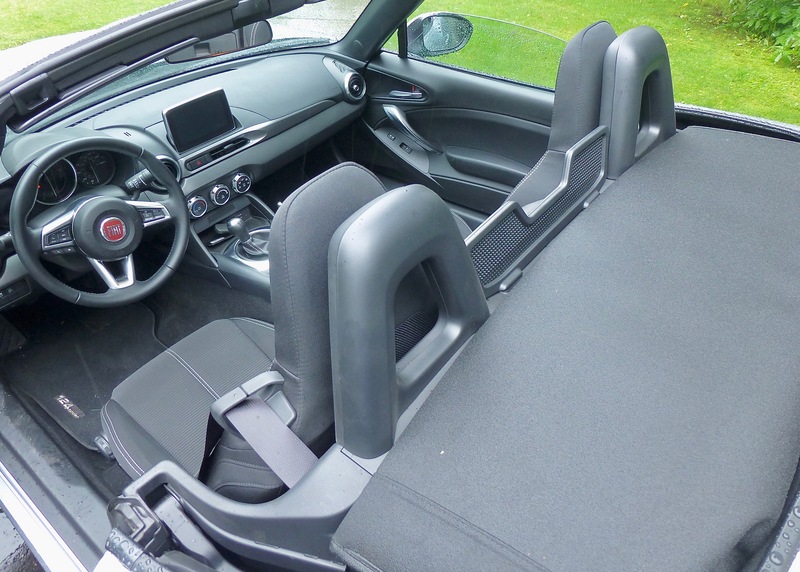 The soft-top 124 Spider has a perfectly fitted fabric top, and, like the Miata, doesn’t offer any fancy electric buttons to make it go down or up. But it does offer an amazingly simple manual operation. You could stop at a stoplight when you realize that you should have put the top down before you left. No problem. Reach up and unlatch the single-latching center point on the top, and it pops ajar. Acoustic fabric roof can be folded down in seconds with one hand. Top folds into its own receptacle, clicks into place, and you’re free. Push the leading edge of the top upward just an inch or so, and relatch the switch so it isn’t dangling, then flip the top up and back, where its perfectly folded and fitted self disappears into itself as you push it back, and as it starts to lower itself into the receptacle behind the tall headrests of the bucket seats, you can reach back — awkwardly, maybe, if you have a sore shoulder — and give it one firm push downward. You are pleasantly surprised at the neat, firm sound as the top clicks down tight. 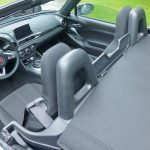 When you hop out of the car, you might be thankful at how much easier it is to extricate yourself when there is no top, but then look at the refined fit of where the top is folded down on top of itself, leaving a hard fabric-covered panel to face the elements. 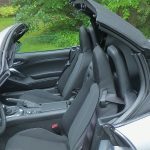 Facing the elements is one of the joys of owning a two-seater sports car. 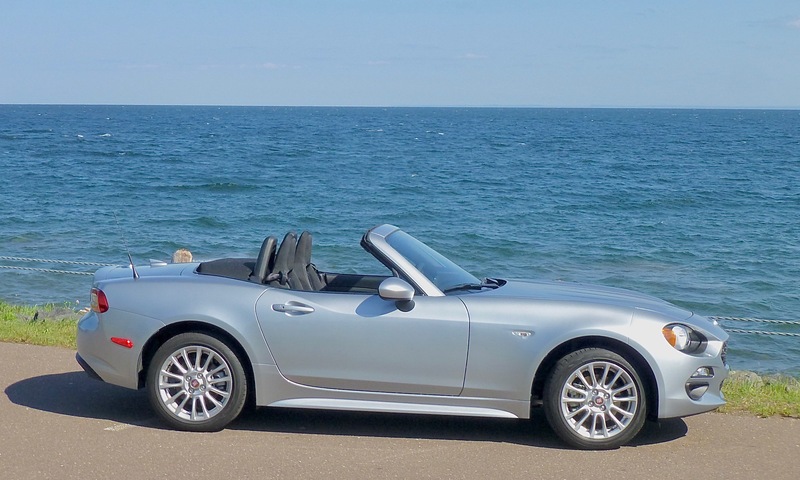 You get used to the wind, but the 124 Spider is remarkably adept at channeling the passing wind to keep on passing, without the anticipated turbulence that you might anticipate lifting your baseball cap off your head and flinging it to the roadway behind you. My older son, Jack, rode with me on a trip from Duluth to near the Twin Cities during the week we had the 124 Spider. I anticipated him grumbling and complaining about the wind, but he — undoubtedly anticipating me grumbling and complaining if he grumbled and complained — never uttered a word of dissent. I put the top down, we strapped ourselves into the buckets, and we were off. It was about a 2-hour drive, and we were comfortable the whole way, registering 32.5 miles per gallon as we sailed along at the 70 mph limit, or whatever any other motorists might be establishing as the norm. Top down, windows down, the 124 Spider can help stretch summer into fall. I have my own set of rules for a two-seat roadster. One is that if it is foul-weather and you need to put the top up, go ahead. But if you put it down, then lower the side windows. True, if it gets nasty you might be tempted to power them up, but to me, nothing looks clunkier than a two-seater with the top down and the side windows up. Just a personal thing. With the top down, getting in a neat trick, too. You don’t need to be a gymnast to put your feet in on the floor while you swing your rear end in and place it against the backrest, then lower yourself down and in perfect place in the seat. You can pretend you are climbing into a Formula 1 car if you choose, but it’s just a neat touch. Touring suspension and electronic stability control undoubtedly had a hand in the handling, although it simply is incomprehensible that the 124 Spider wouldn’t handle with superb, flat stability no matter how aggressively you threw it into a turn. The turn-in is predictably precise, seemingly designed for how hard you might want to zip around curves. It has air-conditioning, although that seems superfluous in most instances. It doesn’t have power seats, either, which is no big thing, because there is precious little room, or need, for much adjustment. It does have power outside mirrors, which I found interesting. It has an adequate trunk, as long as you don’t plan on hauling three weeks of luggage with you on your trip to the shopping center. Rain is no problem; raise and secure the top in a matter of seconds from the driver’s seat. 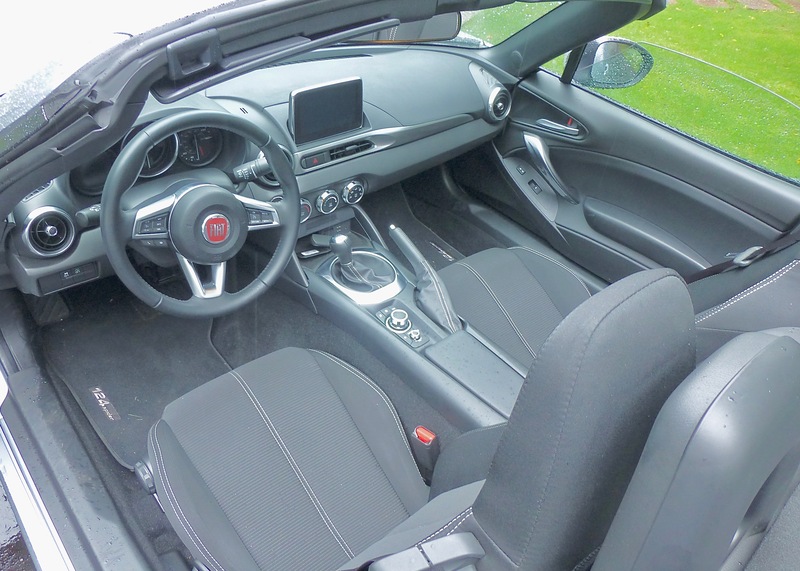 The 124 Spider also has nice options such as satellite radio and a navigation system with a small but adequate screen, and it has a back-up camera and voice-commanded Bluetooth connectivity. Three-season performance tires are mounted on the 16-inch alloy wheels, which indicates you might want to invest in special winter tires, or, better yet, park the 124 Spider unless there are a few of those sunny, dry winter days in your climate. Projector headlights and LED taillights set off the car, fore and aft. The test car showed up with a base sticker price of $24,995, which also was a pleasant surprise, and with the few options it still listed for $27,385. Simple and efficient, the 124 Spider interior is alluring on its own. That is a small price to pay for a vehicle you will pamper and enjoy for as many years as you care to own it. It is not a Porsche, certainly, or a Corvette, but you might enjoy engaging those super-powered sports cars in a neighborhood autocross and surprise them. Sure, you can make the 124 Spider perform, but almost immediately you will find that your pleasure will mainly come from pleasing yourself at the adroit handling and quick-revving, barking engine performance. And that’s more than enough to make the drive to work, or home from work, a time of pure pleasure. More and more cars are offering steering-wheel paddles to allow drivers manual control over automatic or CVT transmissions. A good idea might be to standardize them. Most allow upshifting by pulling on the right-side paddle and downshifting with the left. But a recent road-test of the new Porsche Panamera, the paddles for the slick PDK direct-sequential gearbox were counter-intuitive -- both the right or left thumb paddles could upshift or downshift, but pushing on either one would upshift, and pulling back on either paddle downshifted. I enjoy using paddles, but I spent the full week trying not to downshift when I wanted to upshift. A little simple standardization would alleviate the problem. The Mitsubishi Lancer Evolution has the best paddle system, and Infiniti has made the best mainstream copy of that system for the new Q50, and other sporty models. And why not? It's simply the best. In both, the paddles are long, slender magnesium strips, affixed to the steering column rather than the steering wheel. Pull on the right paddle and upshift, pull on the left and downshift. The beauty is that while needing to upshift in a tight curve might cause a driver to lose the steering wheel paddle for an instant, but having the paddles long, and fixed, means no matter how hard the steering wheel is cranked, reaching anywhere on the right puts the upshift paddle on your fingertips. Even in snow-country, a few stubborn old-school drivers want to stick with rear-wheel drive, but the vast majority realize the clear superiority of front-wheel drive. Going to all-wheel drive, naturally, is the all-out best. But the majority of drivers facing icy roadways complain about traction for going, stopping and steering with all configurations. They overlook the simple but total influence of having the right tires can make. There are several companies that make good all-season or snow tires, but there are precious few that are exceptional. The Bridgestone Blizzak continues to be the best=known and most popular, but in places like Duluth, MN., where scaling 10-12 blocks of 20-30 degree hills is a daily challenge, my favorite is the Nokian WR. Made without compromising tread compound, the Nokians maintain their flexibility no matter how cold it gets, so they stick, even on icy streets, and can turn a skittish car into a winter-beater. John Gilbert is a lifetime Minnesotan and career journalist, specializing in cars and sports during and since spending 30 years at the Minneapolis Tribune, now the Star Tribune. More recently, he has continued translating the high-tech world of autos and sharing his passionate insights as a freelance writer/photographer/broadcaster. A member of the prestigious North American Car and Truck of the Year jury since 1993. John can be heard Monday-Friday from 9-11am on 610 KDAL(www.kdal610.com) on the "John Gilbert Show," and writes a column in the Duluth Reader. Soccer Deserves Close Scrutiny in U.S.